The second most common markings found in the US are British Hallmarks. 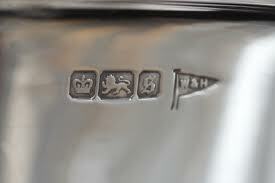 British Hallmarks give us more information on the piece than US Hallmarks. British Markings will have an Assay marking indicating their closest point of origin as well as the makers mark and a letter or symbol indicating the date. 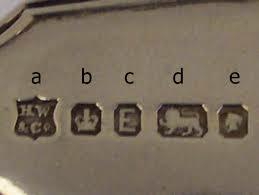 Below are two examples of British Hallmarks. Silver plate items are the easiest to identify because the rules are simple. 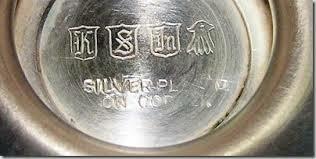 If the piece is not marked “Sterling” , “.925” or have the British Markings it is plated. Below are two examples of plated items, but there are many more examples of plated, these two are more common. 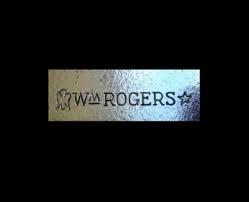 On the second example if the word sterling follows Rogers, it is sterling, if it does not, it is plated. At J Austin & Co we buy sterling flatware, service sets and hollow ware 6 days a week. Please call ahead for an appointment. 541-955-2985 in Grants Pass 541-482-3715 for the Ashland shop.